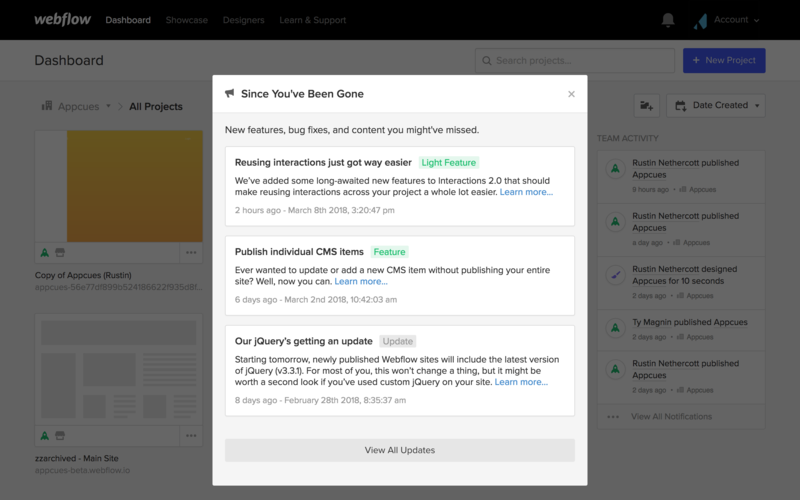 Webflow is a web design and CMS tool that helps users launch and manage their website without any code. Individuals and companies can use this tool in a variety of ways. Items in the list are paired with a color-coded category label, so users can easily see each type of change. This helps users parse through information quicker if they are only interested in Updates and not anything else. Users have the opportunity to Learn More with each item by clicking through the link. This allows users who might not need to understand everything about each feature or update to move on and start using the tool. On the other hand, if people are left with questions, they can immediately learn more. A list modal window is less distracting than various unrelated tooltips popping up in the dashboard. It's a unified news update that allows users to see everything all at once.